The graph tells a clear story of what trade trends are up to. Both exports and imports have been losing momentum. The trade surplus has been under a trend of gradual but steady reduction. Year-on-year manufacturing exports are up by 1.1%. Year-on-year manufacturing imports are lower by 0.1%. The chart is driven by year-over-year growth. Within the most recent 12-month period, trends are slightly different, but the trade balance even for manufactures on their own has stabilized and moved lower compared to its December 2017 level. However, all trends are not created equal on all horizons. We break trends down into manufactures and nonmanufactures to try to get a handle on the more systematic portion of trade (manufactures) vs. the more volatile component (nonmanufactures) where commodity prices and values can move the flows sharply over the short run. Looking at manufacturing trends alone for growth of 12-month and under we find that both imports and exports are growing more strongly over three months than over 12 months. Manufacturing exports are accelerating steadily from 12-month to six-month to three-month. And for both flows, their respective three-month growth rates are still below their pace from one year ago. Still, exports are showing much more life over three months than are imports. Nonmanufacturing flows are showing strong growth over most horizons again with consistently stronger growth for exports compared to imports across all horizons. On balance, the broken down trade flows do raise some questions about whether this long trend of slowdowns for export and import growth and for trade balance reduction is going to stay in place or whether it is in the process of bottoming and being reversed. 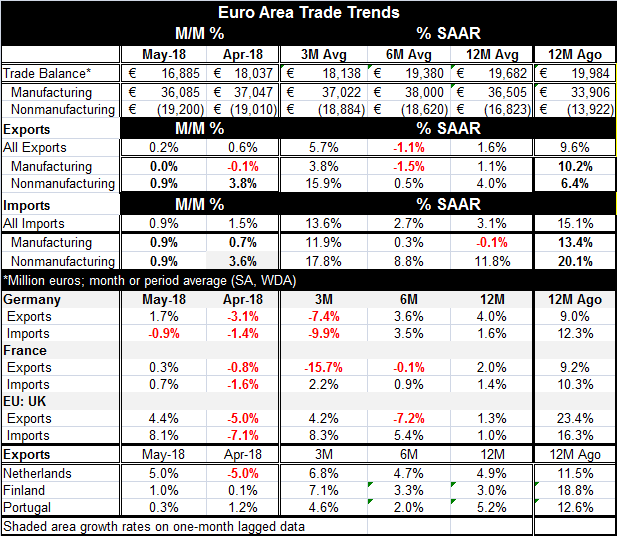 The bottom portion of the table looks at some select trade data for Germany, France and the United Kingdom as well as exports only for the Netherlands, Finland and Portugal. These flows generally show exports and imports (where presented) are expanding. And exports in most cases are growing faster over three months than over 12 months. Except that exports are falling in Germany and France over three months and for Portugal three-month export growth is weaker than 12-month growth. Obviously, trade is still showing a lot of cross currents and the impact of tariffs is getting ready to bite. For this group exports still show signs of moderation since year-over-year export growth was stronger a year ago than it is right now; and three-month growth compared to year-ago export growth is also slower for any country in the table. While economic trends often embrace less than crystal clear trends, the overwhelming evidence here is that trade flows are slowing. There are, of course, cross currents, but there is also a main current. There is the risk and potential of trade and overall growth slowing. Jens Weidmann warned the German government of increasing risks of the economy cooling when he spoke at a July 6 cabinet meeting, the German business newspaper Handelsblatt reported. Germany and Europe already have been showing some signs of reduced growth and then there are political issues, pending tariffs, Brexit and migrant issues, all to provide distractions and to potentially create conflicts that could hamper growth. European growth is not in the bag.